In this area you will find a list of pipe shops, tobacconists and dealerships around the world, all with the one thing in common that they sell new, unsmoked Danish pipes. Only shops represented on the internet with world-wide on-line shopping or mail-order will be found here. The shops are grouped by country - please choose a country in the list below to visit the shops. 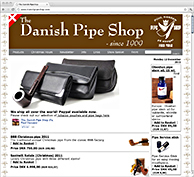 Please let us know, if we have overseen a on-line shop selling Danish handmade pipes. It is our goal to cover the marked the best way possible.